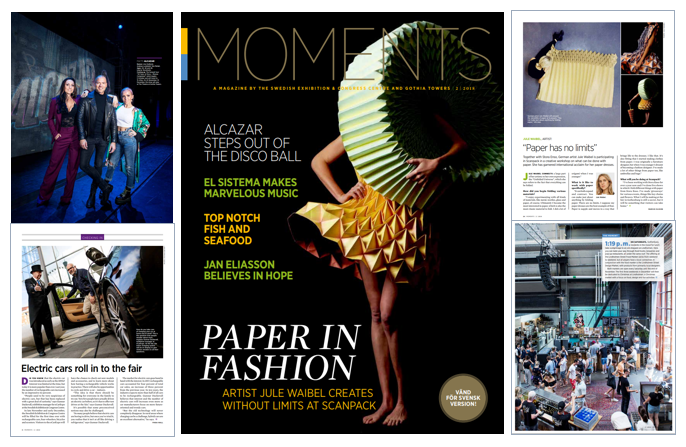 In the new issue of Moments, Alcazar talks about their farewell show and that the audience shall expect one hundered percent joy, music, dance and glitter. We have met paper artist Jule Waibel who tells us about the ”Unfolded Universe” and how she garnered international acclaim for her paper dresses. Autumn is the high season for shellfish in Sweden andwe have met the chef who gave a glimpse of what Imagine’s popular fish and shellfish buffet looks like. Also read about the advances of electric cars at eCarExpo, and discover why music organization El Sisteam each year gather 1,800 children in Gothenburg.